After 45 battles and reaching a high of Rank 15 I have quit ranked battles and sold the Nagato and Hiryu to fund my tier VIII Shokaku carrier that I'm using along with my tier VIII Amagi battleship. Things were ok up until I got into the mid tier in ranked battles. You see, they grouped the players into three tiers, lowest tier from 25-21, mid tier at 20-11, and highest tier at 10-1. As soon as I got into the mid tier I found I had significantly longer waits on getting into matches and as time went on the waits became longer. Now, I have sporadic short times when I can jump on to play and wasting 5 minutes or more in queue is not acceptable for me. It got to the point where I could only confidently get into ranked battles quickly on weekends. The last straw was Monday night where I waited for 10 minutes and still wasn't in a match. Frustrated, I sold the Nagato and Hiryu and didn't look back. Unfortunately, laying out over 20 million credits for two tier VIII ships has drained the account dry and even though I recently unlocked the tier V IJN Furataka cruiser and tier VI IJN Hatsuharu tier VI Mutsuki destroyer, I've put off purchasing them until I rebuild my wallet. 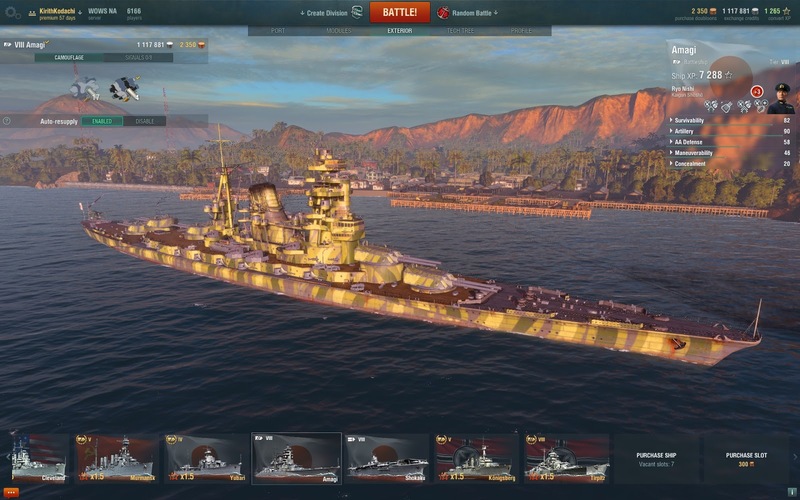 This also means I'll probably have to put off the tier VI USN New Mexico battleship that I'm one battle from unlocking. On the upside, the Amagi is amazing, its like the Nagato (apparently overpowered at tier VII) on sterioids and I've been having lots of fun with it. I've only had a couple battles in the Shokaku and its planes are getting ripped up pretty bad, but I've yet to unlock the upgraded planes so I'm hopeful. 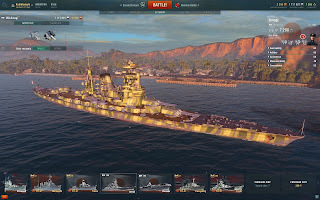 In other news, I got lucky Monday night and got four kills in a battle with my IJN Kuma cruiser (an amazing ship BTW) and got rewarded with a Sea Trial with the German Kreigsmarine Koinsberg tier V cruiser. 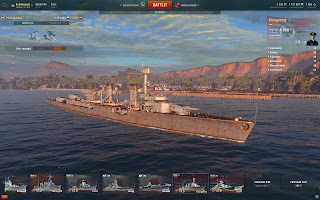 Basically I get to try out the ship for free until the 19th when the cruiser line and Russian destroyer line is released. I really like the ship. Its fast in a straight line and while the guns may not do a lot of damage they certainly are accurate and fast rate of fire. Its like a mini-Cleveland. I'll definitely be running up the line when it is released next week. 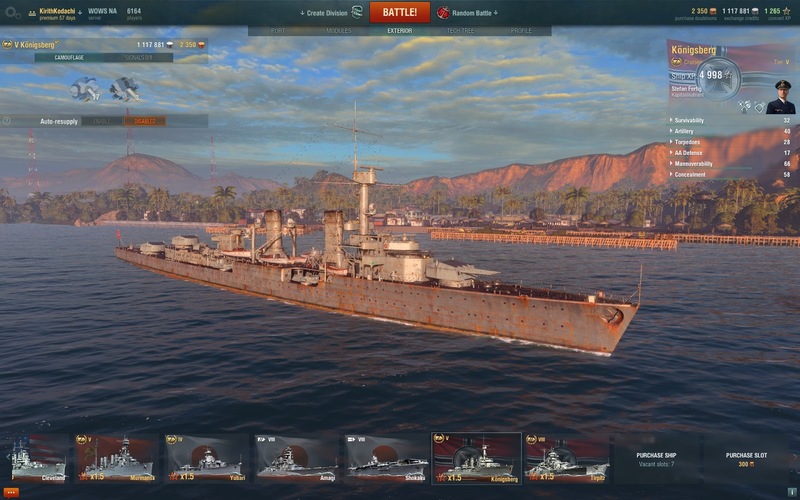 The T6 IJN dessie is the Mutsuki. The Hatsuharu is the T7 one. Which is the one you unlocked? I'm glad to see others with the same issue I've found with Ranked battles. Sure, I'm on a different server (Asia) but I've had 20/30 minute waits at Rank 15 for games and I've pretty much given up on them. They were fun and it's nice being the highest ranked player in my social group but finding a game is taking too damn long now. I have T9 Fletcher and Baltimore that I love to play but I'm making only ~20,000 credits a game, if I'm lucky. Usually it's a negative value so I've had to look at what I can use and between the Cleveland and the New Mexico (I really can't play well with the VII Colorado I unlocked). The New Mexico is a pleasure to use, I'm averaging 2500 XP and 300,000 credits per match and get AT LEAST two kills. It's great coming up against a Fuso or Kongo who are broadside to me and hearing their AP shells bouncing off my angled hull. I've gone from having 762,000 credits to a little over 7m this weekend and that doesn't include the 3 or 4 million I've spent adding new modules to the ships.